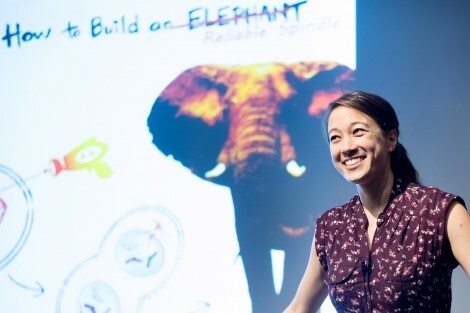 Christina Hueschen, a graduate student in UC San Francisco’s Biomedical Sciences Program, took home the top prize at this year’s UCSF Grad Slam competition for her talk titled “How to Build an Elephant." The third annual Grad Slam, held March 16, featured 10 UCSF graduate students competing to inform and entertain with three-minute science talks based on their own research. Their subjects ranged from the genetics of aging to the rewiring of injured neural circuits to spinal changes in astronauts. Hueschen, a graduate student in the lab of Sophie Dumont , PhD, won first place and the prize of $3,000. She impressed the judges with her talk on the formation of spindle structures, which ensure the correct separation of chromosomes in cell division. “It was a great reminder that the way we talk about our science makes all the difference in how compelling it is to nonscientists and how they feel about us as scientists and about science at large,” she said. Hueschen will go on to represent UCSF at the systemwide Grad Slam event  on May 4. The runner-up prize of $1,500 was awarded to Ashley Smart, a graduate student in the Neuroscience Program, advised by Grae Davis , PhD, and Jim Wells , PhD. Her talk titled, “Death by Light,” was about using light to control the enzyme caspase. “Sometimes in lab you get focused on the small details. Doing something like this makes it feel more real, like there’s a reason beyond pipetting 100 times today, that it’s achieving some broader goal that’s important,” said Smart. The people’s choice award, voted by the audience, was given to Sam Pollock, a graduate student in the Chemistry and Chemical Biology Program, advised by Jim Wells. His talk on antibody therapy for tumors kept the audience laughing with an extended metaphor on doughnut glazes and the sprinkles that stick to them. He received $750. The 10 finalists were selected by a panel of screening judges from entries submitted by video. Daniel Lowenstein , MD, executive vice chancellor and provost of UCSF, was among the judges of the live event. “The threads of analogy and humor and passion about their work made it an exciting event to be at. It’s a spectacular lineup of remarkable young people doing exciting, exhilarating science,” he said, adding that the strength of all the presentations made the judges’ decision a difficult one. Elizabeth Watkins , PhD, dean of the Graduate Division and vice chancellor of Student Academic Affairs, emceed the competition. “The students did a great job of making sure people outside the scientific community can understand the research they’re doing and why they’re doing it – and I think that message is as important now as it’s ever been,” she said. This article was originally written by Nina Bai  and published by UCSF .